The New Year is officially upon us. It’s time to reflect on the new and improved tools, resources, and innovative ideas–just on the horizon–that will come to shape how brands interact with and market to consumers during 2018. In order to resonate with consumers through social media marketing, it’s worth considering that: content is more important than ever before, and integrating a video component into any brand story has become critical. More individuals are viewing ads, shopping, and perusing social media content through mobile devices than computers and laptops. According to comScore’s 2017 U.S. Cross-Platform Future in Focus report, mobile usage represents 7 in 10 digital media minutes. Your content marketing game needs to be centered on mobile optimization in 2018. Rich content drives the most engagement. Stock photos and simple posts don’t warrant conversation anymore. Interaction is key, and the number one way to foster interaction is through video content, according to recent reports. Whether it’s Live Video, regular videos for Instagram and YouTube, or just quick off-the-cuff videos on new products and services, this kind of content will draw your audience even closer. Marketing has become more intimate and relationship-based today. Consumers are tired of anonymity and cold marketing schemes, giving way to the rise of user-generated content. According to Nielsen’s Global Trust in Advertising report, more than 83 percent of consumers will trust a recommendation from someone they know. Organic, yet professional, ways of showcasing consumer reviews and remarks will become an integral part to social media marketing in 2018. Snapchat changed the world when it introduced the concept of fleeting, temporary content that disappears into the cyber world forever upon completion. Instagram and Facebook feverishly followed suit, introducing a Stories feature for looping 24-hour content that disappears after the hourly allotment. Ephemeral content will continue to drive social media marketing efforts this year, emphasizing the value and originality of content that has a predefined shelf life. It makes products and services seem more valuable and unique. Artificial intelligence, chatbots, and Virtual Reality are defining how we interact with content today. Chatbots, preprogrammed robots that can handle an infinite amount of customer service questions and concerns, are becoming increasingly popular with brands. Social media chatbots can be embedded into your social platform chatboxes, enabling customers to order items, ask questions, and decide on products. You can preprogram as many answers into the bots as you please, essentially replacing an entire customer service department moving forward. 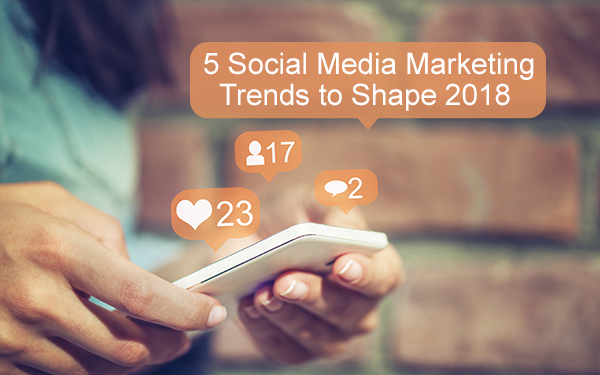 The world of social media marketing changes at an exponential pace. Though it can be hard to follow, the 2018 social media marketing landscape will be underscored by video marketing, chatbot support, ephemeral content, user-generated content, and mobile marketing features that make content marketing as convenient as possible.